Here the log is rolled up onto two slabs from a previous cutting. It is far better and easier on the back to work up off the ground as much as possible. In this way also you avoid obstacles in the way of the saw or jig. To the right of the log is the jig guide. It is nailed to the log, supported where needed by wedges of wood or bark so that the first cut can be made. Also pictured in the image is my "cant hook" or "pevee" as they are called. 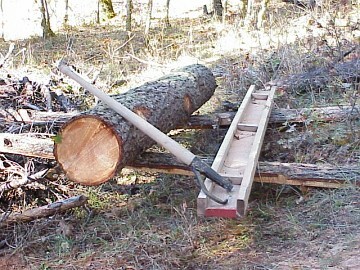 This tool makes moving large logs fairly easy. Sometimes I call it a "can't hook" :) .